ExoLytic is a world-class management consulting and training firm that has been improving the business processes of companies for many years. We have a comprehensive series of highly rated instructor-led training programs and a variety of quality-based consulting services. ExoLytic specializes in ISO-Based management systems such as: ISO 9001, ISO 27001, IATF 16949, AS 9100, ISO 13485, and many others. Whether you are looking to be registered to one of these standards, improve your already registered company, or improve your Management Systems in general, ExoLytic has a program to fit your needs. We offer services in Quality, Lean Manufacturing, Supply Chain Management, Operations from training to implementation consulting. 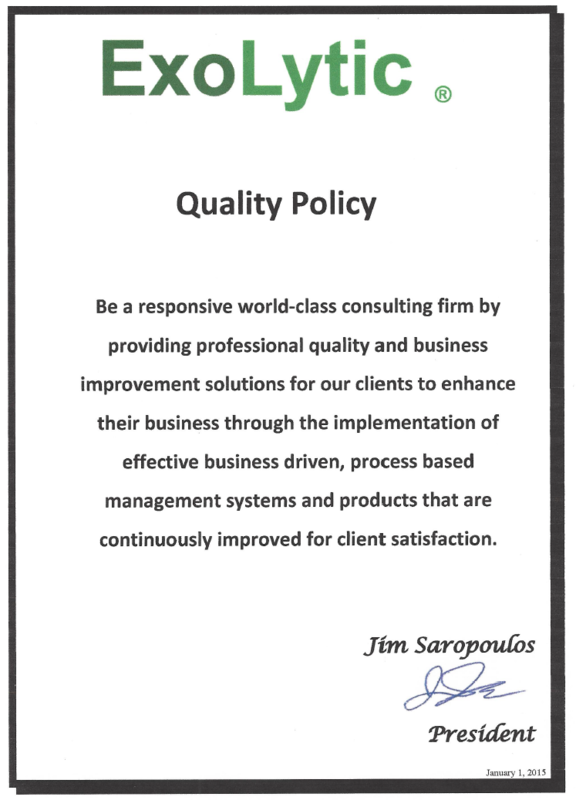 ExoLytic uses ISO 9001, and other standards as tools to help companies improve. Registration is a goal, but it is not the only goal. We believe that by establishing efficient and robust management systems that are designed to learn from themselves and improve on a regular basis, registration is easy and the rewards are great. Let's work together to improve your organization and reach a common goal of continuous improvement.